Southern senior Shelbi Dailey pulls into third base during the Lady Tornadoes’ 14-1 victory over Miller on Friday in Racine, Ohio. RACINE, Ohio — Into the win column in a big way. 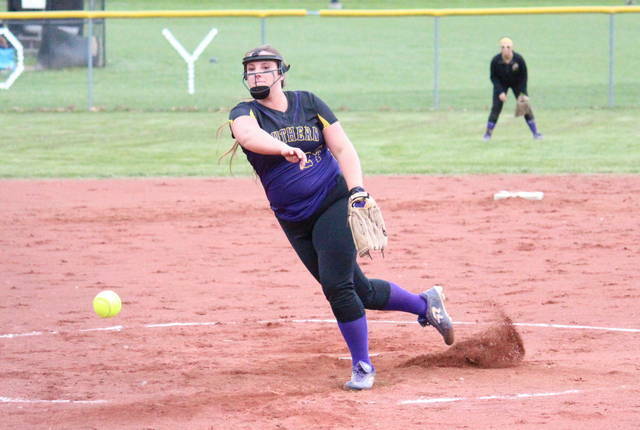 The Southern softball team picked up its first win of the season on Friday at Star Mill Park, defeating Tri-Valley Conference Hocking Division guest Miller by a 14-1 count in six innings. Southern (1-2, 1-1) broke the scoreless tie in the bottom of the first inning, as Sydney Cleland singled home Jaiden Roberts and Josie Cundiff. 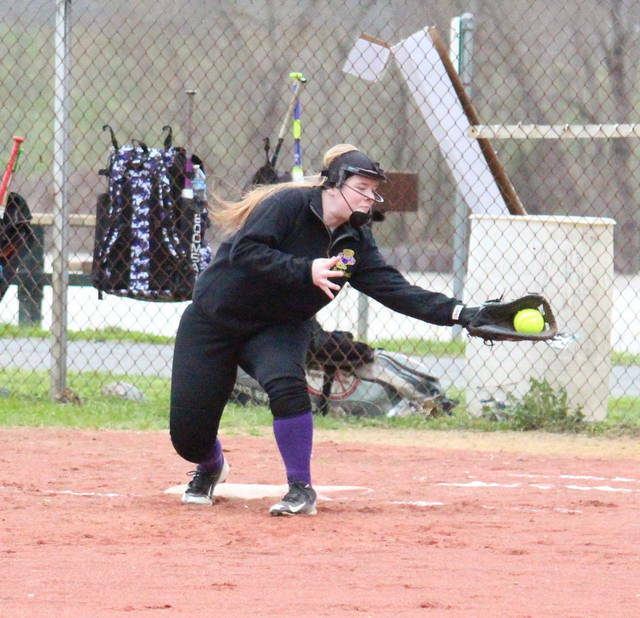 The Lady Tornadoes added one to their total in the bottom of the second when Kassie Barton drove in Shelbi Dailey. Cundiff doubled with one gone in the SHS third inning and then scored on an error. 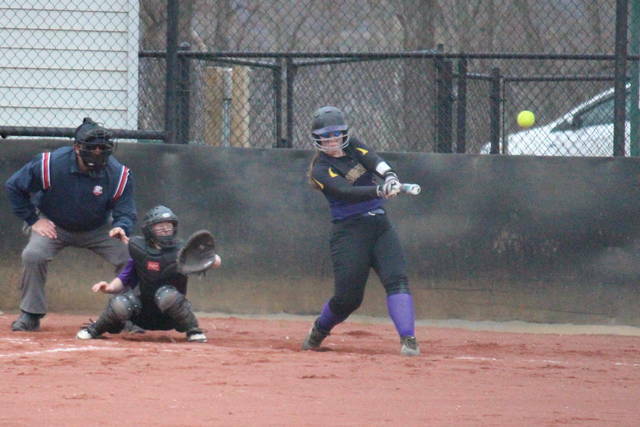 Still with one out in the third, Paige VanMeter blasted a two-run home run, giving the Lady Tornadoes a 6-0 edge. Southern was scoreless in the fourth inning, but moved ahead 8-0 in the bottom of the fifth, as Lauren Lavender tripled home Ciera Whitesell and then scored on a double by Dailey. Miller scored its only run of the game in the top of the sixth inning as Chappelear reached on an error and then scored on a groundout. In the bottom of the sixth, Cleland singled home Roberts and Cundiff, and then Dailey hit a grand slam home run to cap off the 14-1 mercy rule victory. Cleland was the winning pitcher of record in a complete game for Southern, striking out eight batters and allowing one unearned run on four hits. Turkovich struck out one and suffered the setback in in a complete game for the Lady Falcons, allowing 14 runs on 13 hits and three walks. 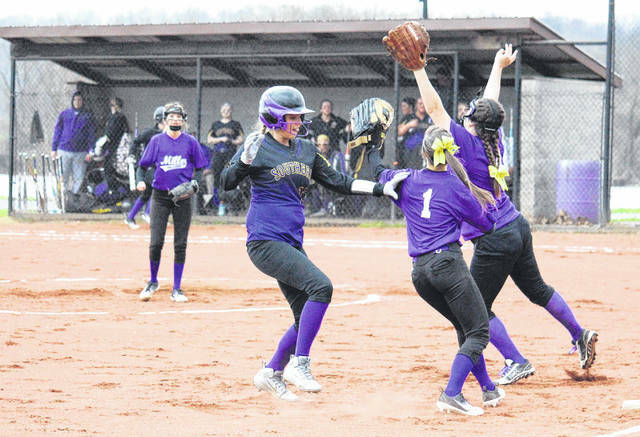 For the Lady Tornado offense, Cundiff was 3-for-4 with a double and three runs scored, Dailey was 2-for-3 with a home run, a double, five RBIs and two runs scored, Lavender was 2-for-3 with a triple, two runs scored and one RBI, and Cleland was 2-for-3 with five RBIs. VanMeter hit a home run, scored once and drive in two runs, while Barton and Kaitlyn DeLaCruz both singled once, with Barton picking up an RBI. Whitesell scored three times in the game, while Kayla Boyer scored once. Turkovich had two hits to lead the Lady Falcons at the plate, while Perani and Youtsey each had one. Rine picked up an RBI, while Chappelear scored once. Southern committed one error and left four runners on base, while Miller had three errors and three runners stranded. These teams will meet for the rematch on April 25 in Hemlock. Southern is slated to face Trimble on Monday.